Oh My Goods could have been better than it is, but even failing to live up to its promise leaves us with a great game that I very much enjoy playing. We gave it four stars in our review so you know – maybe I should spend a bit more time thinking about what it is rather than what it could be. Our next question for Meeple Like Us is whether it could be a game for you – could you play it, and how much fun would you have if you could? Our review gets refined into a teardown, and that teardown itself acts as fuel for angst and tears in the darker corners of the Internet. So let’s crack on – we don’t have time to waste here. Colour blindness is a small problem, but it does have an impact. Each card has a colour that’s used to indicate the building class although all the key information that goes along with that is represented iconographically – you rarely need to know to which category a card belongs. But you do need to know it when it comes to buying an apprentice – their availability is dictated by the composition of your tableau. It’s here that there’s an issue for those with colour blindness. It’s not a persistent problem, and only manifests in some circumstances. You can ask the table as to what cards are needed in order to purchase an apprentice and it won’t have much game impact. This is the only area where problems occasionally emerge, and only with some categories of colour blindness. As such, we’ll still offer a recommendation for Oh My Goods in this category. 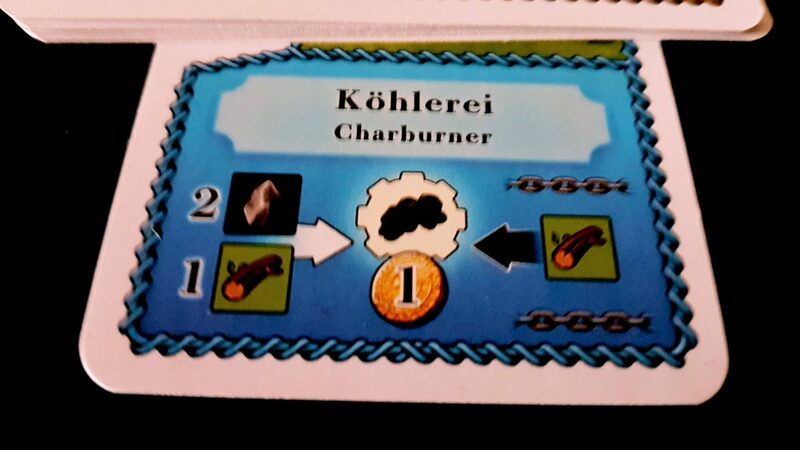 The version of the game I have is dual language so the text is presented in both German and in English. That’s a little distracting, but there are single language versions available. Generally though the text descriptions have little relevance to the game itself – it’s the iconographic information along the bottom that matters. This shows what is needed in the marketplace in order for construction to trigger, and also the components that go into a production chain. It also shows the good that gets produced, and the value of that good. That’s a lot of information, and understanding it comes with a lot of different symbols to parse. Icons are quite small and occasionally share a considerable amount of their silhouette with other icons. The difference between an iron bar and a piece of coal for example is some colouring and straightness of the shape. With poor visual acuity these can become indistinguishable without close inspection. It’s not terrible, and often there’s an additional degree of discrimination offered by the background colour. Goods have a white background, raw resources have a coloured background. It will be something of an issue though that has an impact on game flow, especially when you consider the amount of churn in the game and how much cross-referencing of symbols you’ll be doing. That cross-referencing reaches its peak in the market phase which requires players to make an accounting of what buildings they have, what resources are available in abundance, and what resources are available in their hand. Armed with this knowledge, players must decide what buildings are producing and the disposition of their worker. This is the core decision in the game, and as a result it’s critical to get it right. Players will be making judgements based on partial information, and that partial information is provided in iconographic form in all the relevant cards. Now, it’s not quite as bad as it might seem provided a player can make an inventory of their options. Essentially what the market phase renders down to is something like ‘There are two wood and a cloth’, and then this data needs checked against the player’s tableau. In other words, it’s not really a visual parsing exercise – provided the table can narrate the options available, the visual challenge is considerably lessened. However it’s not eliminated because each player has a hidden hand of cards, and the composition of that hand will greatly impact on what actions a player may wish to take. Knowing that you’ve got the stone to compensate for a bad draw may be enough for you to make a decision, as might knowing that you’ve got the components for a lucrative production chain if the afternoon goes well. That information is locked into the bottom of your cards laid out in your tableau. You will have, at most, eight of those to worry about but there’s quite a lot of state relationship between them that needs to be taken into account. In other words, each time your decision point comes you’ll take an inventory of market supplies. You then need to choose your action based on an analysis incorporating as many as eight buildings and a hand of no fixed limit. It’s not impossible, but it is certainly something that will have an impact on play. For those for whom total blindness must be considered, we’d advise players stay away from Oh My Goods – the hidden hands have no information on them other than what can be obtained visually. For those with less severe visual impairments, we’ll offer the most tentative of tentative recommendations. Oh My Goods is inherently a game of evaluating probability within a fixed window of uncertainty. You’re making decisions based on the likelihood of resources being available. There’s a non-uniform distribution of goods (there’s more wood than anything else) and a little more than half of these cards have sun symbols on them. This by itself plays havoc on any attempt to explicitly calculate chance – you’re going to alter the probability of resources by the simple fact of building facilities. However, also locked into this is the fact that cards act as goods (removing them from the draw pile), and so the composition of the deck is uncertain. The chance you’ll get a resource drawn depends on how many suns that have appeared already versus the total draw of cards, modified by the distribution of buildings, modified by the number of those that have cards acting as goods. An explicit understanding of probability helps, but it’s not at all reliable. A formal understanding of the mathematics involved, in other words, is less helpful than might be expected. An intuitive understanding though is needed, and it’s not simply a case that this is for optimising play. It’s fundamental to being able to play at all. 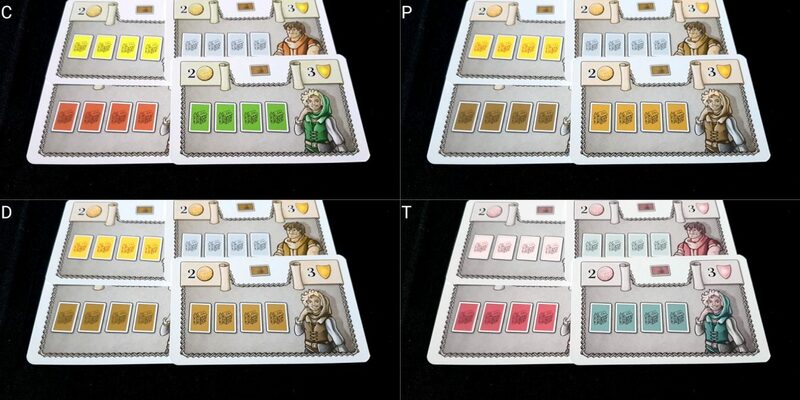 When the first draw of cards for the market is made, players must assess the likelihood they’ll have resources to trigger particular buildings. If you’re lucky, a single draw might be enough to trigger production – usually it won’t. As such, you’re betting on the narrowing of a probability window – that the action to which you commit is most likely to be the one to yield optimal results. If you mess this up, you produce nothing. If you produce nothing, you get no money. If you have no money, you can’t build. It’s common to miss your chance here by betting big on what seems like a sure thing only for nothing to happen. It’s even more common to miss your chance by misreading the probabilities the game presents you. Two or three turns of this can happen back to back, and as such there is a formal barrier to participation – if you can’t deal with the shifting probabilities, you won’t be able to do anything. In that circumstance, you have to rely on random chance and even here things aren’t straightforward because that randomness is not uniform. You’re more likely to draw wood than clay. You’re slightly more likely to draw a sun than not. You’re less likely to draw wood the more wood has been drawn. If you play percentages in their simple form, you won’t succeed as much as you might expect. This isn’t like a dice roll – not directly. You begin with approximately a 28% chance to draw wood, but that shifts and wriggles with every single turn. So while there are guidelines such as ‘wood is more common’, that doesn’t actually translate into an actionable heuristic for play. You really need to know how the deck is going to change to be in with a reasonable chance of producing anything. That has to be interpreted in light of your hand too – you have one-use resources you can feed into a facility to make it produce even if you fail in your estimation of outcome. The problem there is that often your plans will be dependent on those cards as building opportunities – to use one for production, or for a production chain, is to lose the opportunity for building it. You can only build cards from your hand, and as such the choice to discard one must be weighed up for cost and benefits. Coupled to this is the economy of production chains. You can toss three wood cards into your charburner to produce three coal – it’s safe and easy. There might though be a better strategy that comes from building them for the opportunity to produce goods that generate more money for sales. The value of a good is both in terms of flat arithmetic and in terms of what it enables for future production. Coal is a compound requirement of many productions, as an example. You might not want to waste it purely on building other facilities. Oh My Goods is not a complicated game in real terms. Certainly not when you look at many of the other games we’ve covered for the blog. It’s complex though and decisions involve an awful lot of factors that stress tactical and strategic play. There’s a fair degree of numeracy involved (addition, multiplication, and occasionally comparison of values), but it’s primarily the probability calculations that are a likely area of concern. The cognitive cost for play is not unreasonable, although the rules are a little clunky and unintuitive in places. The cognitive cost for enjoyment though is much higher. Given all this, we don’t recommend Oh My Goods in either of our categories of cognitive accessibility. Competition is only over the availability of apprentices, and you can see a collision in that respect coming from a mile off. They are dependent on the colour composition of your tableau, so if two people are going for the same apprentice it’ll be pretty obvious. Otherwise, there’s no competition in play – market resources are available in abundance to everyone, and everything else comes from a card draw. It’s a very solitary experience. The emotional accessibility issues then are in the probabilities we discussed above in the section on cognitive accessibility. It’s very easy to miss your chance to produce in a turn because you either misjudged the deck or were simply screwed by fate. You get to choose your action based on one of two card draws, but that doesn’t mean you’ll have been right. You may have made a decision based on a single piece of wood coming out only to find that all you get is endless bolts of cloth and quarries full of stone. That can be frustrating, but what’s worse is the palpable sense of missed opportunity that comes from knowing if you’d been a little more adventurous you could have reaped greater rewards. Oh My Goods shows the ‘road not taken’ after every single turn. This isn’t necessarily a problem, but it does create a situation of escalating failure – kind of. It’s not that you fail more often, but you fail increasingly often in comparison to your opponents. Someone having two buildings available that rely on different goods is going to have more chance of taking advantage of the market than you with your single charburner. Sometimes you fail to produce because of the deck and not because of your choices. Everyone starts with a random charburner, and it’s entirely possible it won’t produce for you for a while regardless of what you do. Cards in your deck offer some degree of mitigation against this, but they too are dependent on you having access to the resources you need when you draw them. Randomness is a substantive feature of play. I wouldn’t say this was necessarily a massive problem – it can be funny as often as it is frustrating. However, it does lead to a simple truth – some people won’t get to have as much fun playing as others, because they won’t get to do as much. That might genuinely come down to the Catan problem of saying ‘Well, I guess my action this turn is to pass’. If you don’t produce goods, you don’t get money. If you don’t get money, you can’t build. Score follows an unusual, and not entirely successful, model of diminishing returns for investment. 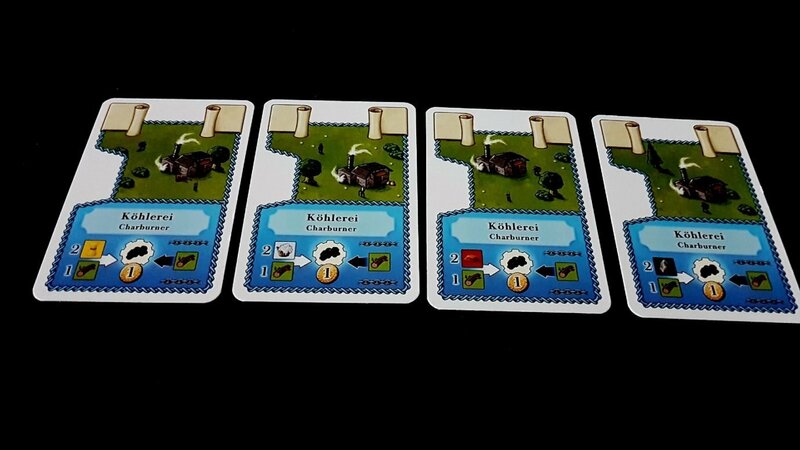 Building three ranches for eighteen coins will net you six victory points. 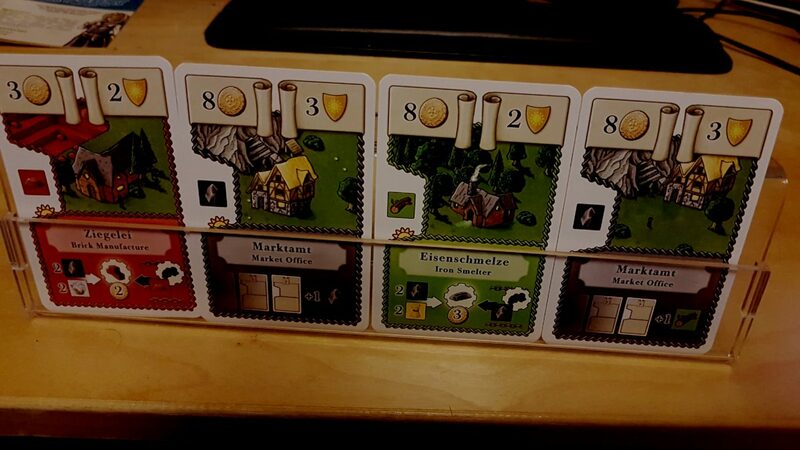 Building three sawmills for six coins will net you… six victory points. The ranch offers more opportunities for wealth generation, but it’s also much harder to get everything you need to line up in order to take full advantage of this. As such, it’s difficult to become a runaway winner because it becomes increasingly difficult to leverage the advantages provided by even the most expensive buildings you construct. The result is that score disparities tend not to be excessive. Overall, we’ll recommend Oh My Goods in this category – while there are some potential flash points here they’re situational and not endemic. They represent occasional annoyances rather than the default expectation anyone should have. 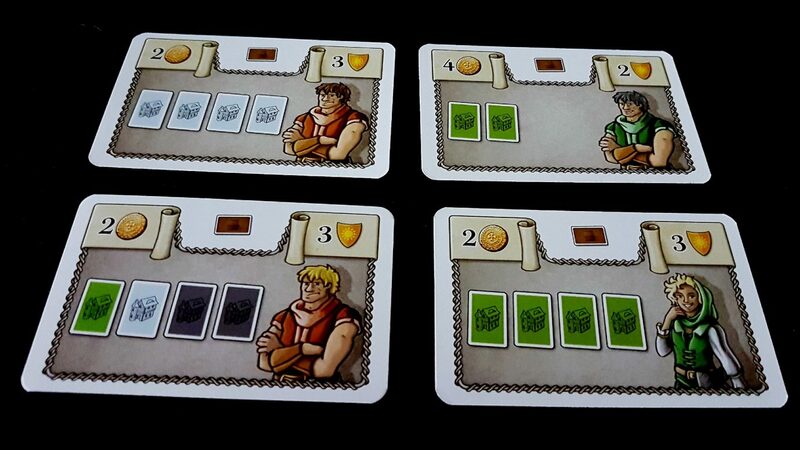 There’s a lot of hand management in Oh My Goods, and an awful lot of churn in the cards. You’re constantly drawing cards, discarding cards, moving cards from one building to another, and drawing them out in phases to the market. This churn leads to the need for regular shuffling of the deck, and the deck consists of 94 cards – at least at the beginning of the game. The longer the game goes on, the smaller the deck becomes but the more often it needs shuffled. Within Oh My Goods you’re dealing with a hand that has no upper bound on how many cards it contains. This is the primary source of physical inaccessibility because the key payload information in the cards is on the left hand side and the bottom. That means you need an unobstructed view of the bottom of the card. Transparent card holders will be fine, but those made of an opaque material will hide more information that would be desired. My card holder manages four cards at a time, and with a standard complement of seven you’ll likely need two card holders, or perhaps even three, to comfortably deal with the number of cards you’ll be holding. As you’ll see from the image above, you can’t have them overlap because then you lose key information about how the buildings work. You can certainly compress them and reveal only the resource for which they stand but that’s only partial information. Verbalisation is possible, but not necessarily intuitive. Each card has a name to identify the kind of building, but the resources it may require will vary depending on the specific card. One iron smelter may require two stone and two cloth, another may need two wheat and two clay. As such a degree of disambiguation in instruction will be required. ‘Use my fifth card to provide the final clay I need for my second iron smelter’. Often you won’t have more than one of the same kind of building (you don’t have enough room in your tableau for redundancy) unless it’s to take advantage of this variability. When you do though, you’ll need to be precise. The larger issue here for verbalisation is just how much card manipulation is required. Within a single round you might draw three cards, make use of one to fuel a production and discard another four to fuel production chains. In this case the articulation required for explanation is precise because even if you’re throwing almost all the wood you have into the charburner you might want to keep a specific card back for later use. This is cumbersome more than it is a problem, but if someone is acting on a player’s behalf they may find this asks more of them than is usually the case. We’ll tentatively recommend Oh My Goods in this category. The name of buildings is written on the card, but it’s not necessary information – all that matters really is input, output and production chains. As such, you can play this in complete silence and without any reference to the text. We strongly recommend Oh My Goods in this category. 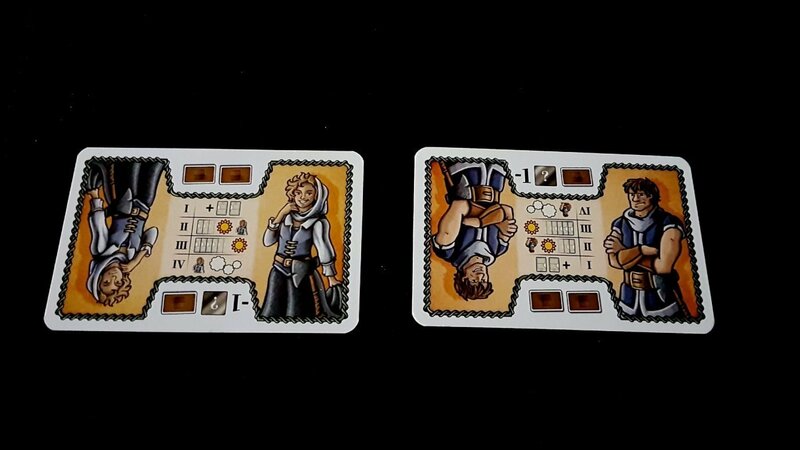 The worker and apprentice cards are reversible, and show a burly man on one side and a woman on the other. Ethnicity is somewhat ambiguous which permits you to project what you want onto the characters. Within limits. Other art on the cards is mostly of the buildings themselves. Small human figures are seen dotted around the grounds of the building but they’re too small to make out any particular identifying features. The box shows the woman character prominently represented on the front, which is a nice change from the usual that you tend to see in games with this kind of vaguely medieval pastoral theme. The instructions are in the second person, and do not default to masculinity. 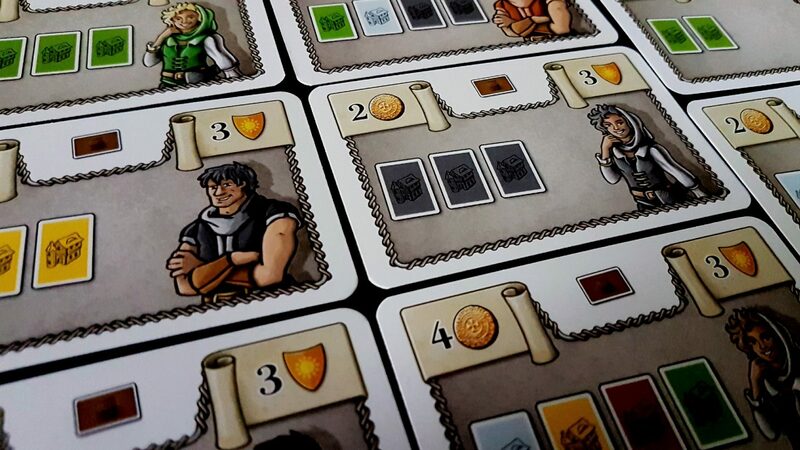 Oh My Goods has an RRP of £12 and plays up to four players – really, the value for money here is tremendous given that this is a genuinely good game with an awful lot of staying power. We absolutely can’t fault it. According to BGG it plays well at all levels, and while it’s probably best at two there’s no count, short of solo, that has a serious level of disapproval. If visual impairments compounded with physical impairments, normally that would be enough for us to reverse our recommendations. However, the market state is easy to verbalise and players need not rely on close inspection for that. However, the extent to which players can bring assistive aids to examine the cards in their hand is a more significant issue. Our recommendation then depends on the compensation regime that can be brought to bear in that circumstance – if players can examine their cards freely there shouldn’t be a major issue. If they can’t, then another game is likely more appropriate. Oh My Goods is a reasonably quick game – around 30 minutes barring accessibility considerations. As such, it isn’t long enough, or intense enough, to exacerbate issues of distress. It doesn’t cleanly support players dropping out of play, but since the play is quite solitary there are arrangements that could be made. The biggest impact really is on cards that are locked away from circulation, and the number of apprentices in play. In both cases, house-rules can be adopted to permit this to be handled without much game impact. A game that involves riding probability like it was a head-strong stallion is going to be difficult in the cognitive categories. While you don’t need to be able to articulate the mathematics involved, you need to be able to appreciate the way they’re shifting. That and the intensely synergistic way the game deck intersects with this probability is what makes Oh My Goods a problem in our cognitive categories of accessibility. As tentative as some of our other recommendations are, there’s reason to believe this game is broadly playable if a group wants to make the effort. There’s scope in here for improvement too, from the iconography used to the layout of the cards when placed in a card holder. 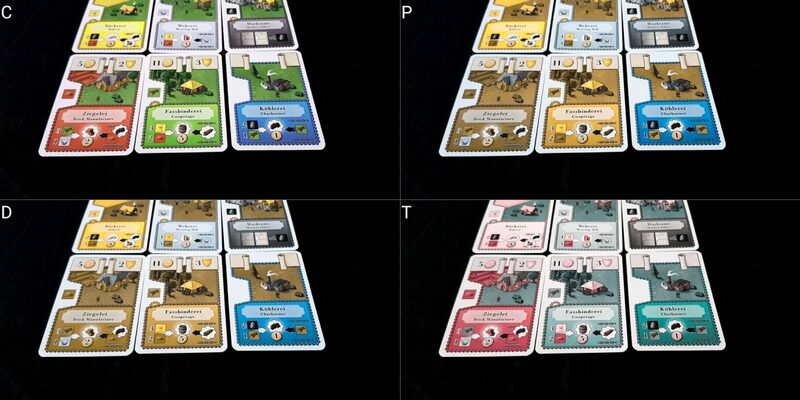 While there’s not much that could be done to make Oh My Goods more accommodating for players with cognitive impairments, there are easy fixes in everything else if a publisher wanted to make an effort for a future edition. We gave Oh My Goods four star in our review – it could have been higher, but we review the game as it is rather than the game as it was promised. Even with its limitations it’s a fine addition to a game library, and if you think you would be able to play it it’s worth taking any opportunity to try it out.